I am excited to share with you one of my favorite quick side dish products that I use all the time. While this post is sponsored, all thoughts and opinions are my own. Dinner in our house is always a major rush. I love cooking but sometimes just can’t find the time to make an elaborate meal and still get everything else done. I’m sure you know the feeling. Now that school has started and with it all of the after-school activities, my time for cooking is even less than before. 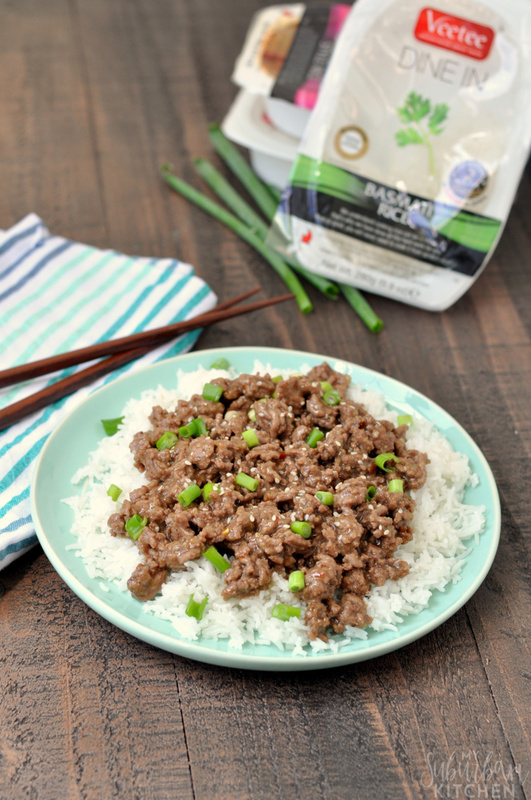 Thankfully, I can make recipes like easy Korean beef and pair them with easy to cook Veetee rice for the perfect quick dinner. Typically, Korean style beef is thinly sliced pieces of beef that are marinated overnight before being cooked. 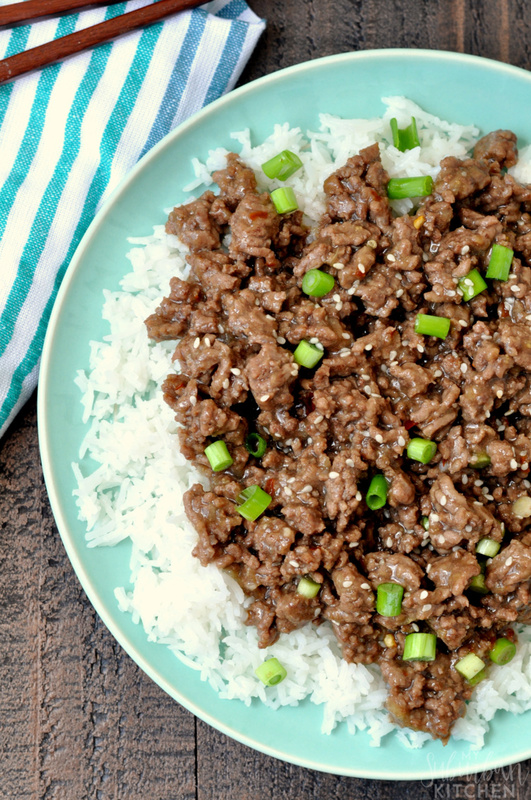 My version substitutes ground beef for the beef slices and skips the marinating so you can get dinner done super fast. 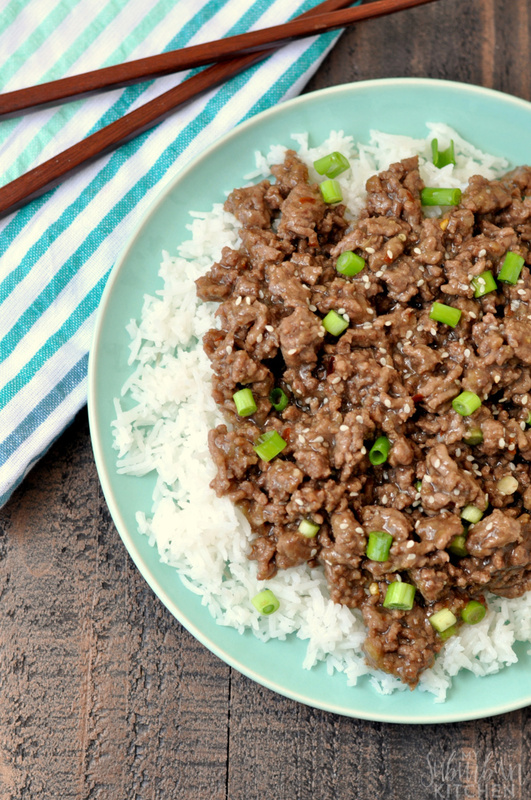 Veetee rice is the perfect compliment to the Korean beef and is ready in only 2 minutes! Despite how quickly they cook, the rices taste like you’ve been working on them for a long time making sure they were cooked perfectly. With several varieties, including Thai Jasmine, Spanish and Basmati, we use it a lot to go with whatever meal we may be having for the evening. 1. In a small bowl, whisk together the pear, honey, coconut aminos, sesame oil, crushed red pepper, ginger and garlic. Set aside. 2. Heat a medium sauté pan over medium heat. Add ground beef and cook, stirring to crumble, until browned; about 5 minutes. Drain any excess fat and return to pan over medium-low heat. 3. Stir in pear mixture and cook for 2-3 minutes. Remove from heat and stir in green onions. Serve over rice topped with additional green onions and sesame seeds. Note: If you can’t find an Asian pear in your grocery store, feel free to substitute any regular pear. The difference in taste won’t really be noticeable. What are your favorite weeknight meals? 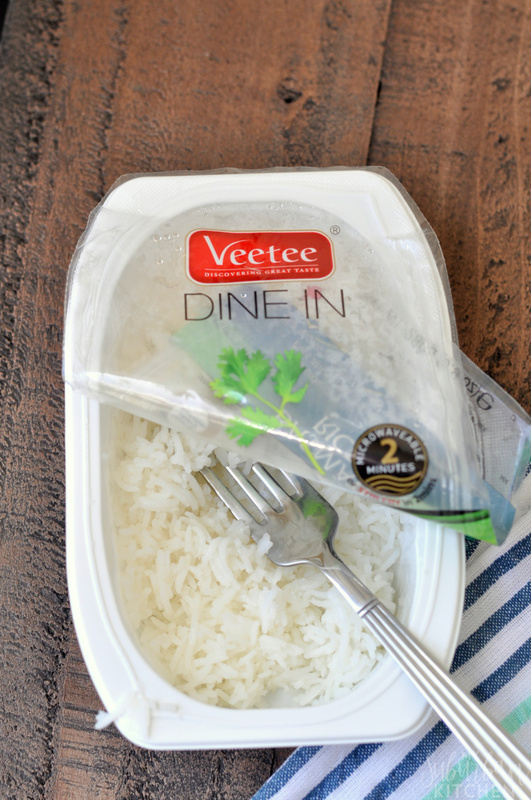 Have you tried using quick cooking products like Veetee rice before to make getting dinner done easier? Veetee Rice is giving away two six packs of rice to one lucky reader. The reader will get to choose their favorite flavors. Just follow the instructions in the form below to enter! In a small bowl, whisk together the pear, honey, coconut aminos, sesame oil, crushed red pepper, ginger and garlic. Set aside. Heat a medium sauté pan over medium heat. Add ground beef and cook, stirring to crumble, until browned; about 5 minutes. Drain any excess fat and return to pan over medium-low heat. Stir in pear mixture and cook for 2-3 minutes. Remove from heat and stir in green onions. Serve over rice topped with additional green onions and sesame seeds. If you can not locate an Asian pear in your store, you can substitute a regular pear. This looks delicious. I have a niece and nephews that are part Korean. I would love to be able to fix this beef dish for them. Thanks for sharing on Sunday’s Best Linkup. This is my kind of dinner- my family will love it! Yummy! What a wonderful weeknight meal! Looks delicious! Thank you for linking up to the Creative K Kids’ tasty Tuesday, I can’t wait to see what you come up with next week. My kind of recipes – simple and delicious! Thanks for sharing on the What’s for Dinner link up and don’t forget to leave a comment at the party – Next week’s features that also leave a comment get pinned and tweeted! This recipe sounds so good. 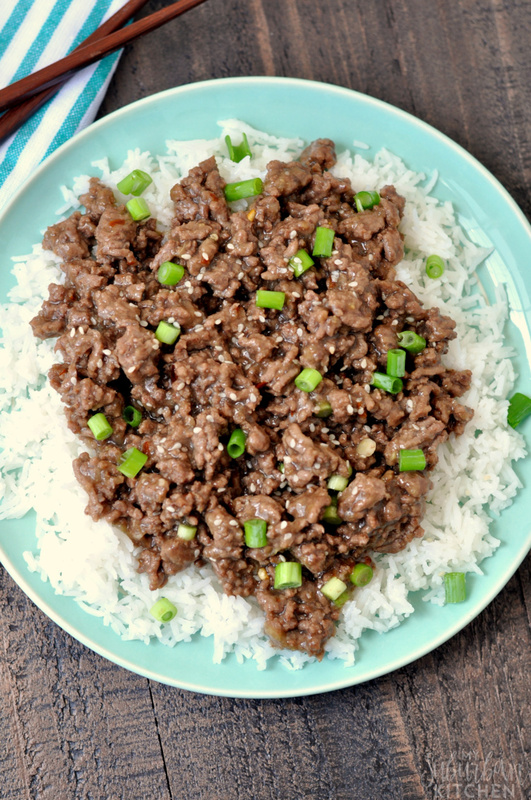 I have never tried anything like Korean beef and rice. Thank you for sharing it with us at the #HomeMattersParty this week. Oh I really want to try this!